I am searching for the person who shopped in my booth at the Michigan Fiber Festival this past week-end and lost some of their purchases. Your bag was turned into our booth so please contact me and I will reconnect you with your goodies! I Am An Olympic Junkie! Despite all the work I still have to do to get ready for Sauder Village and Michigan Fiber Festival, I have been captivated by the Olympics and have been watching it every night. I just can't help myself...I love the Olympics! I think my favorite is the swimming. I was on the swim team in high school but I was never good at the competitive part. I swam the backstroke and I used to love to swim laps in practice. And a bonus to being on the girl's swim team meant that we could be lane timers for the boy's swim team! Yes, I was a lane timer and we used regular stop watches to time the races....none of this high-tech stuff was even imaginable at the time I was in high school! Of course, I can't just sit still when I am riveted to the television, so I have been hooking away with abandon. I am really loving my little mat just as much as I am loving the Olympics. Just a couple more nights and I should be done. 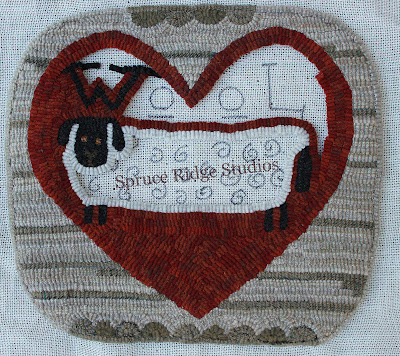 This is Wool Ewe Be Mine, a Notforgotten Farm adaptation. I think it is just the sweetest little mat and it has been a joy to hook. I hooked the background in straight lines and made it look a little like old white-washed boards. I almost never complete the outside portion of a rug before I do the middle, but I was so carried away that I just kept going until the whole outside border was completed. I will probably make the curls of the sheep little quillie circles. I have not totally decided yet but that is what keeps popping into my head when I look at this. 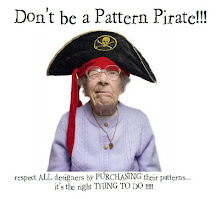 Sometimes you have to let the pattern talk to you and it will let you know what it wants to be. If you would like to order this pattern, or purchase the same wool I used for it, just let me know! And just one last question....are you an Olympic junkie too?